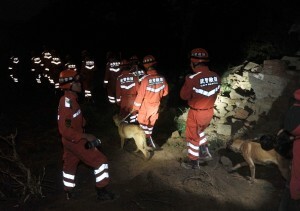 Eighty-nine people are dead so far in a powerful earthquake that hit northwest China’s Gansu Province Monday morning. A 6.6 magnitude quake jolted the border of Minxian and Zhangxian counties at 7:45 am on Monday. Four-hundred and twenty-two aftershocks had been recorded in the quake-hit region, with the strongest measuring 5.6 in magnitude, Chang Zhengguo, spokesman for the provincial government, said at a press conference held in the provincial capital of Lanzhou. Over 1,200 houses have collapsed and another 21,000 severely damaged, with some villages cut off from communication. Two helicopters and about 3,000 armed police, firefighters are involved in rescue efforts.